If you’ve been in to get some glasses from us in the past few months you may have noticed we do things a bit differently. 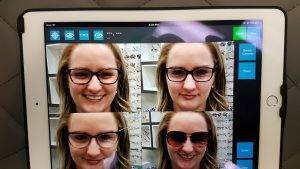 In order to make our glasses and prescriptions more accurate we’ve invested in the Optikam Pad. This new tool allows us to take more measurements of you and how your frame fits, we can take pictures of you wearing frames and do a side-by-side comparison of up to four pictures, we can demonstrate the differences between our different progressive designs, and we can show a comparison of your lens thickness in different materials. There’s a lot it can do! When you pick a frame from our showroom we will then take ten measurements, instead of the usual two, to provide the best visual outcome. 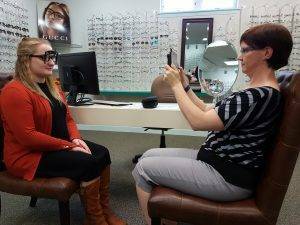 We not only measure the distance between your pupils (pupillary distance) to line the lenses up with your eyes horizontally, but we also do the same vertically, along with how far the frame sits from your eyes, and the tilt and wrap of the frame on your face. This ensures your prescription is optimized for the frame you choose and how it fits on your face. There have been many breakthroughs in lens technology and now, with these measurements, we can take advantage of them. The side-by-side picture comparison is great to help decide on the perfect frame, or frames, for you. For those who cannot see themselves clearly in a mirror without their glasses on, now have that ability after the pictures are taken. We can even email the pictures to someone for extra feedback! If you wear progressive lenses you may remember being told about different lens options, but never understood what that really meant. Well, we can now show you the difference in a comparison mode, or even have you look around the room using the iPad’s camera to demonstrate the difference (augmented reality). 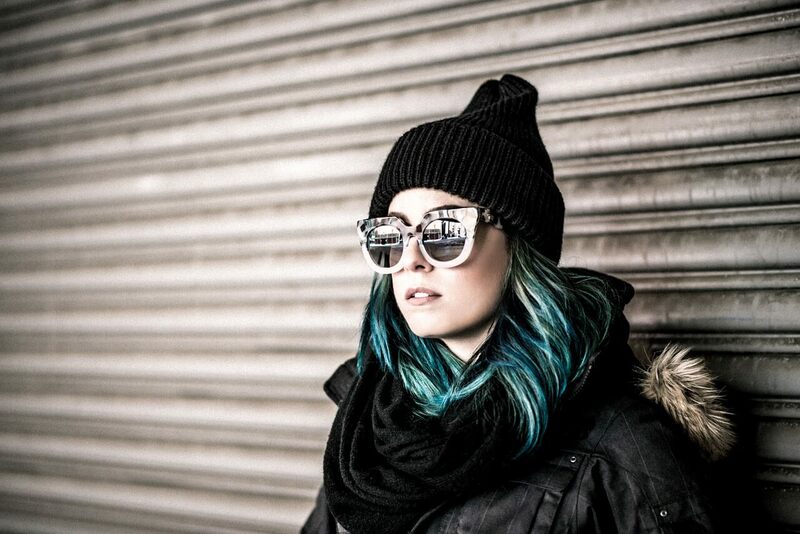 You can then make a more informed decision on which lens option will work better for you. 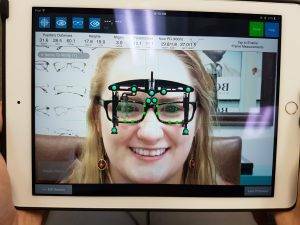 We can also address the question of “How thick will my lenses be?” The program can simulate lens thickness taking into account how the frame fits on your face and the frame sizing. It can show the lens in different materials with the accompanying difference in thickness size. We’re very excited to have this new tool to help provide a great experience for you. It’s just another way we continue to give modern eyecare to our patients.